By this point in our two week Mexican re-boot I should probably be filling you in on the local specialities we’d got to sample, like the ceviche being piled on plates with salted biscuits, heaped on top of succulent avocados with ripe mango or served on tacos dressed with coriander and lime. And all of those dishes were stunning ways to try fresh white fish and prawns washed down with a cold draft beer. But I’ve waxed lyrical about ceviche more than once before, and here at PFB we like to keep our write-ups as fresh as the Mexicans do their fish. 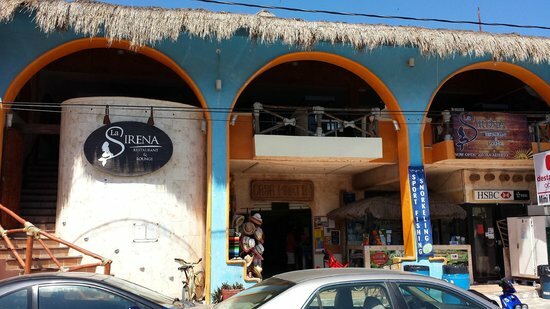 So on our last night in Puerto Morelos we headed to La Sirena … a Greek restaurant. La Sirena occupied prime real estate on the corner of the town’s main square, overlooking couples holding hands on the marching ground and families eating ice creams on park benches. We were greeted warmly by the female maitre D’, who we assumed to be the Helano-Mexican daughter of the owner, and took a table on the balcony outside. The prices were steep, reflecting what the large groups of American tourists nearby were prepared to pay on their holidays, so a full meal was out of the question. But we had enough for a couple of glasses of white wine, a Greek salad (for Clare), an octopus starter and – on the recommendation of a holiday-maker leaving as we entered, spanakopita (spinach and feta in filo pastry). I’m obsessed about octopus, and there aren’t many nations who know better how to cook it than Greece. This dish was no exception: a bowl of hot stew, perfectly combining tender chunks of octopus with a light white wine and garlic broth, accompanied by a hunk of lightly toasted bread. The spanakopita that followed was served with a tzatziki dip in bite-sized parcels: each one a sweet, moreish envelope of salty white cheese and tangy leaves. In a wind-stepped corner of Mexican paradise, the Greeks had surprisingly won the day. After four nights in Western-friendly Puerto, we decided to disappear off the all-inclusive tourist trail in the Mayan Rivieria and headed inland to check out the best of the Yucatan peninsular’s history and cuisine. We chose Valladolid, the state’s third biggest city, as we’d read on message boards that it was a great weekend bolt-hole to escape the heat of the coast, and the perfect jumping-off point to explore the nearby Mayan ruins of Chichen Itza. Three hours later our second class bus belched loudly and deposited us in the colonial city a few blocks north of the the famous Sisal Convent where we’d found a boutique hotel opposite offering a ‘double-double’ suite with an ostentatiously large and ornate bathroom for little more than the average cost of hotel rooms in the region. Clare wrote about the horrible history of the Maya during our time in Chiapas, so I don’t need to tell you much more about the sites of interest at Chichen Itza, other than to say that most of the temples fulfilled their usual civic and ceremonial functions, viz: temples dedicated to the art of ritual beheading; stone circles employed to appease vengeful gods through child sacrifice; platforms decorated with the skulls of traitors pour decourager les autres. But it wasn’t all wanton, bloody violence, oh no: the state thoughtfully entertained its citizens with heart-stopping games of football (juegos de pelota) – literally heart-stopping in the case of the losing team, which was summarily hanged from large stone hoops erected on either side of the pitch. The only other things of note to add here are that a) the ruins have been so beautifully restored that tourists aren’t allowed to climb any of them any more, which is probably a good thing in the long run, but does deny the visitor an opportunity to get a sense of the scale of the lost city, or get up close and personal with the perfectly preserved inner temples, complete with intricate carvings and murals on the walls and ceilings, at the top. And b) slogging round temples in the heat of the Mexican afternoon is hungry work. And that’s a very good thing because of course this particular corner of Mexico is brimming with delicious street-food and indigenous fare – almost all retailing for the going rate of ten pesos, or 50 cents, and many of them hailing from the Mayan cuisine. Talking of banana leaves, I have to tell you all about Cochinita Pibil. But that is for another time dear reader, right here on Prawns for Breakfast. Stay tuned.